History - New Hope Services, Inc.
New Hope Services has a rich history of meeting the human services needs of people throughout Southern Indiana. With a record spanning 60 years, New Hope is one of the largest and most successful nonprofit organizations in the Louisville region and has been publicly recognized as a model in the delivery of developmental services. Originally, New Hope focused solely on children with developmental disabilities in Clark County. Services have expanded, and today it focuses on three primary programs: Adult Services, Family Services, and Housing & Community Development. Currently, New Hope serves more than 14,000 individuals and families in 20 counties in southern and southeastern Indiana. 1958 – Spring – A group of Clark County parents began meeting. August. The Council for Retarded Children of Clark County, Indiana, Inc. was incorporated. 1962 – October – First class of 14 students began at Ewing Lane Elementary School. 1966 – New Hope School opened in the fall on Hwy 62 between Jeffersonville and Charlestown. 1967 – Ewing Lane class moved to Parkview Jr. High School to accommodate growth. First full-time executive director hired, L. Dean Burkett. 1969 – Satellite classroom for pre-school children opened at Grace Presbyterian Church in Clarksville. 1974 – New Hope Center moved into the former IUS library at 725 Wall Street. 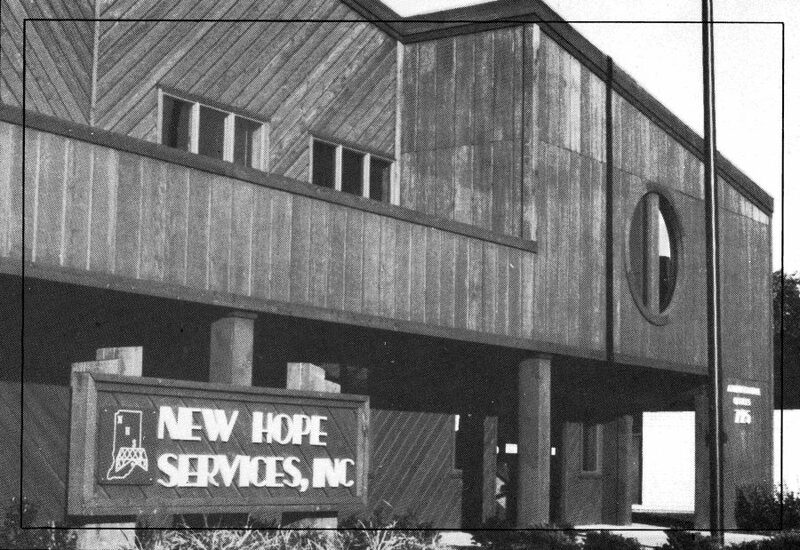 1980 – The corporation name officially changed to New Hope Services, Inc.
1982 – A lot on Spring Street, next to New Hope Center, was acquired to expand the facility. 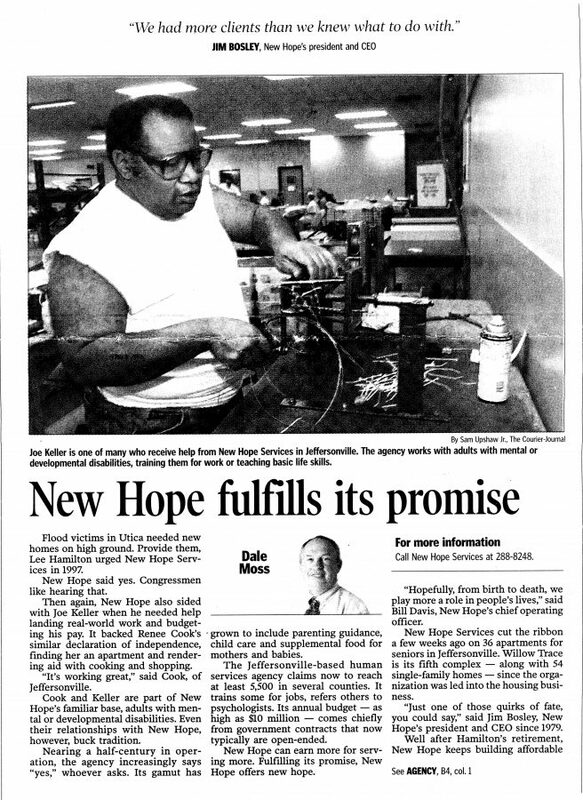 1984 – New Hope remodeled the Wall Street building and established a screen print business utilizing workshop clients. Another New Hope venture was the manufacturing of sports clocks for various colleges/high schools, including Indiana University. 1985 – Pre-school classroom opened at First Christian Church in Scottsburg. 1988 – A new facility, Kids Place, was built and opened in October with capacity for 80 children. 1991 – A 15,000 square foot adult vocational training and workshop opened in Austin as Futures UnLTD. 1995 – New Hope became the Scott County provider for the WIC program. 1997 – As the result of a major flood affecting Utica and Southern Indiana Counties, New Hope created an affordable housing program, New Home, building 30 homes by early 2000, 45 homes by 2003. 2000 – New Hope was actively involved in tax credit program and broke ground for a 64-unit called Highland Glen Apartments in Scottsburg. Received approval for Quartermaster Court, a 32-unit project in Jeffersonville. 2002 – Seven houses were planned for Pleasant Ridge in Charlestown. Forest Glen, a 37-unit senior citizen project in Elwood, Madison County and River’s Edge, 39-unit apartments in Clinton, Vermillion County was approved. 2003 – Willow Trace, a 36-unit senior citizens complex on Spring Street, was approved. The first-ever capital campaign was organized and raised over $1.2 million. 2006 – New To You, a thrift store/donation center opened on Hwy 131 (Lewis & Clark Parkway) to provide additional revenue for programs. 2007 – A former physician’s office building was acquired at 1302 Wall Street to accommodate the Clark County WIC program and expansion of office space. The former Masonic Orphanage on Park Place was purchased for future programming for special needs children. 2008 – New Hope celebrated its 50th Anniversary and achieved its first capital campaign goal, raising over $1.3 million. New Hope also received a $500,000 loan from FHLBI for Park Place Children’s Home. 2009 – Park Place Children’s Home officially opened. 2010 – Healthy Families expanded to include Fayette, Union, and Rush counties. Aberdeen Woods and the 8th and Ohio Flood Relief projects were approved. 2011 – Hope SeniorCare and the Connections programs launched to meet the evolving needs of the people of Southern Indiana. 2016 – Davis Zeller Place in Brazil, IN awarded rental housing tax credits for housing. Highland Glen in Scottsburg awarded $3,875,500 for expansion and renovation. Healthy Families program expands into six more counties in southeast Indiana. Work Services awarded ISO 9001-2015 certification. Aberdeen Woods Phase V approved; awarded funding of $1.35 million. New Hope started renovation on M. Fine on Spring senior housing development. 2017 – The Lofts at Leeson’s in Elwood, IN awarded historic tax credit funding to develop affordable housing for seniors and individuals with disabilities. Aberdeen Woods Phase V was completed, and M. Fine on Spring opened. 2018 – New Hope celebrated its 60th anniversary. Highland Glen in Scottsburg completed renovations. Davis Zeller Place in Brazil, IN opened.